At the bottom of this stack, barely readable, is Schloss Bros. / Ribbons. A closer view brings this out only slightly better. But for a 90-year-old sign, what can you expect. The Schloss Bros. manufactured ribbons here from 1914 until the early 1930s. The brothers were Arthur Schloss (1874-?) and Emil Schloss (1875/76-?). Their father was Louis Schloss, listed in the 1880 US Census as Schloss Louis 49 born Prussia Wholesale Fancy Goods, living at 391 Canal St. with his wife Bella 40 born Belgium, sons Joseph J 8, Arthur 6, and Emil 4, and daughter Dinah 1. Arthur and Emil began their ribbon business in the late 1890s, originally located at 1303 3d Ave. (near 75th St.) where their father Louis ran a branch of his fancy goods business. They moved downtown to Broadway near Spring St. around 1900 and into the building above in 1914. This ad for Schloss Bros. at 31-33 East 28th Street appeared in the Garment Manufacturers Index, January, 1921. They stayed here until the early 1930s, but some time in the early 1920s the partnership dissolved. Emil remained president of Schloss Bros. (click for 1925 ad), while Arthur started his own company, Arthur Schloss & Co., dealing in silks a block further east at 118 E. 28th St.
Around 1933 Schloss Bros. moved to 79 Madison Ave., and they stayed in business there until the early 1950s. 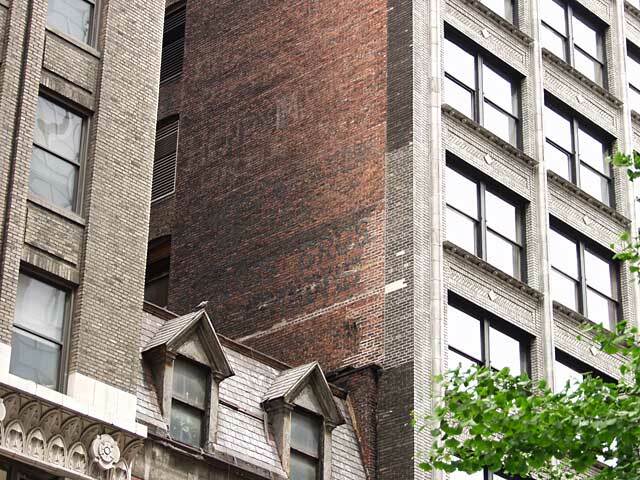 Just above Schloss Bros. is another faded sign for J Freystadt & Sons / Furriers. (Click for closer view.) J. Freystadt was Jacob Freystadt (ca.1822-1892) who died 8 April 1892 at the age of 70. He was an immigrant from Prussia, and he appears in the U. S. Census of 1880 living with his family at 209 East 112th St. The sons were Edward A. Freystadt (1853-1921) and William H. Freystadt (1857-1927). In the 1880 census they are living with the family on 112th St. Edward's occupation is given as furrier and William's as commercial traveler. William Freystadt was born in Minnesota. The family must have traveled through that area of the country before settling in New York. Jacob Freystadt began his business in the mid-1870s, and they were located here at 31 E. 28th St. from 1914 to 1936. The company is listed among the new incorporations of 1920 (New York Times, 22 Jan. 1920, p. 33) with the following officers: "W. Schieferdecker, W. H. and E. M. Freystadt." W. Schieferdecker was Walter L. Schieferdecker (1887-1966), born Roda, Saxony, 1 Nov. 1887, immigrated 1912. He was involved with J. Freystadt & Sons from around 1917. W. H. Freystadt was William Freystadt, and E. M. Freystadt was William Freystadt's son, Everett M. Freystadt (1890-1971). On 29 Sept. 1936 the New York Times (pg. 49) reported "J. Freystadt & Sons, Inc., one of the city's oldest retail fur establishments, has leased the store, basement, mezzanine and part of the second floor at 240 Madison Avenue, between Thirty-seventh and Thirty-eighth Streets, for their retail fur business. The Freystadt firm has occupied only three locations in sixty years, starting in 1876 on Mercer Street and later moving to East Twelfth Street. For the past twenty years it has been at 31 East Twenty-eighth Street." The business stayed at 240 Madison Ave. until the early 1950s, then continued at several locations further uptown near 5th Ave. until the mid-1990s (primarily at 47 E. 58th St. from 1971 to 1994).